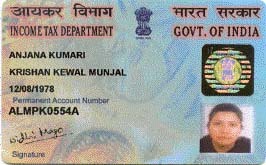 PAN Card for indian residents in just 15 days at their postal address all over India-Mumbai,Delhi,Bangalore,Hyderabad,Chennai,Kolkatta,Pune,Hyderabad-all India.-100 percent guaranteed for Rs 300/-.PAN is now compulsory for everyone to enter into any transation in India. Step-1-Please take printout of the 49A PAN form shown on the bottom of this page-fill it up with a pen-mention only your Indian residential postal address. (Please dont mention your A.O Code, area code, ward,range and representative assessee details. It shall be taken care by us.) Affix the snap on the space provided, fill up all the miscellanous particulars and sign it -one beneath the snap and the other at the end of the form. Step-3 Credit card/debit card/visa/master card-You are required to make the payment of Rs 300/- online via ,master card/credit card/online banking on the link shown at the bottom of the page shown down below or you can directly deposit Rs 300/- online into our bank account as-under-"Nikunj and Associates", Axis bank, Worli branch, Annie beasant rd, Mumbai, India, account number- 911020044421789 . After making the payment, scan the aforesaid documents and the 49A PAN form in jpg or pdf format and send the same to us via email at our email address specified down below. email: contact@filereturn.com (documents are to be sent at this email address). Please note-We are private people-not government people. We just undertake the activity of filing 49a PAN applications with UTI and guarantee you the delivery of PAN card in just 10 days at your Indian postal address.We shall process the work only after receipt in advance of our charges.